Michelle would love to see you at her Photography exhibition. We have two rehearsals before the 21st May concert and cake at de Molay house, please bring a few friends and a cake. Please where blue, yellow or white for cancer council colours. This is a fund raiser for them. I have recorded some of our last rehearsal on my phone sitting on the keyboard. This is for everyone to brush up on the songs we will be performing. It will be under repertoire as it is for our members only. Keep on walking forward, One Voice, La Basta and Fields of Gold. 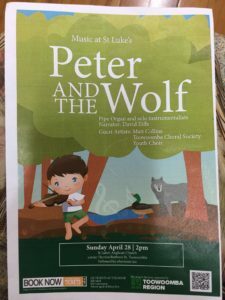 There is a performance of Peter and the Wolf – Check it out with – Matt Collins. Our next rehearsal is Tues 16th Apr 6:45 for a 7pm start De Molay House. Here are just a few of our upcoming events you may wish to put in your diary. We have a confirmed date/time for our performance at the Christmas Wonderland. Do hope it will suit most members. Have to be mighty quick to get the preferred time. I have asked to be notified if the early session becomes available. A small planning group (Annmarie, Charlotte, Bernie and Pam) have started organising a community concert to raise funds for the Cancer Council. To make it as simple as possible it will be on a rehearsal night and in De Molay House with Astrid and Matt. Jess from the Cancer Council will organise advertising in the Chronicle, is happy to come to explain on the night how funds raised will be used and has given us a kit to use in preparing for it. Brian has kindly offered to be our MC. Besides our excellent singing contribution, we have a few other possible performers but would appreciate more suggestions. (Would Jo be prepared to do a solo maybe?) Michelle’s drummers, HAH quartet, Philo small group, Bill Tyers (guitar) are considering it. Astrid it would be great to have an audience participation number. Matt you haven’t got a puppet that sings, I suppose? What would make a fun finale?? We would like choir members to advertise the concert far and wide beforehand, come by 6.30 if possible, wear any combination of blue, yellow and white (C.C. colours) and provide a delicious cake. The lighting on the stage in the hall is not good (3 fluoro tubes). How could we improve it? What about the sound? ?